Corban University Named a “Tree Campus” by the Arbor Day Foundation Arbor Day Foundation Honors Corban University with 2018 Tree Campus USA® Recognition. This past month, Corban University was honored with the 2018 Tree Campus USA® recognition by the Arbor Day Foundation for its commitment to effective urban forest management. Among nonnative trees, Corban’s campus displays several Sequoia trees, two of which exceed twenty feet in circumference. In girth, they are the largest trees on campus. They are fast-growing trees and were likely planted about 1940 by arborists employed in the days of the Oregon Tuberculosis Hospital. Corban also has some fine Northern Red Oak, Northern Pin Oak, Tulip-Poplar, London Plane-American Sycamore trees, and a Cedar of Lebanon. Many trees are already marked with identification signs, and John Scott notes, “This is an ongoing project.” In addition to tree identification, efforts to develop a stewardship plan for Corban’s trees—in large part due to the work of Ben Pearson, Associate Dean of Community Engagement and head of the Tree Campus Committee—have qualified the University for the Arbor Day Foundation recognition. The Tree Campus USA program honors colleges and universities for effective campus forest management and for engaging staff and students in conservation goals. Corban University achieved the title by meeting Tree Campus USA’s five standards, which include maintaining a tree advisory committee, a campus tree care plan, dedicated annual expenditures for its campus tree program, an Arbor Day observance, and a student service-learning project. Currently, Corban is one of 364 campuses across the United States with this recognition. About the Arbor Day Foundation: The Arbor Day Foundation is a million-member nonprofit conservation and education organization with the mission to inspire people to plant, nurture, and celebrate trees. The Arbor Day Foundation has helped campuses throughout the country plant thousands of trees, and Tree Campus USA colleges and universities invested more than $51 million in campus forest management last year. 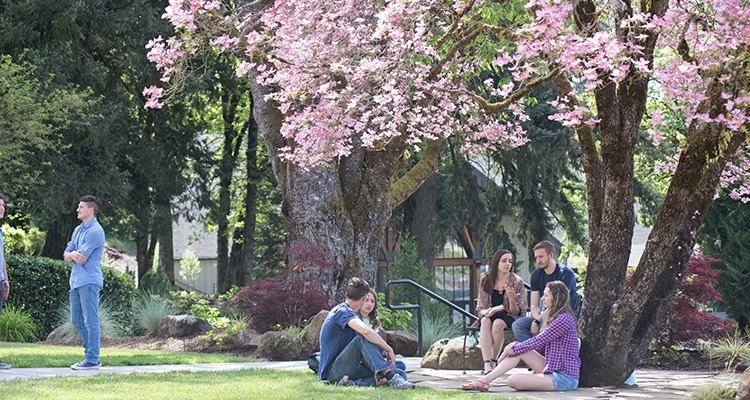 About Corban University: Corban is a private Christian university in the heart of the Willamette Valley. Situated on a forested hillside just outside Oregon’s capital, Corban is located an hour from Portland, the Cascade Mountains, and the Oregon coast. Academic excellence at the undergraduate, graduate, and doctoral levels, as well as online, prepares students for careers as business leaders, educators, medical professionals, politicians, ministry leaders, and more. Expert faculty, a tight-knit community, and opportunities for local and global engagement provide for students’ growth both in and beyond the classroom.